Disneyland! Happiest Place on Earth right? Well, I found this inspiring little meme from Neghar this morning, and I love it. 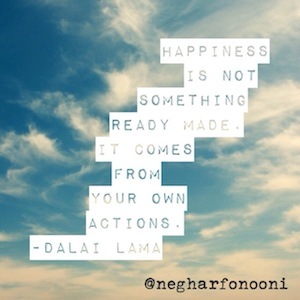 Happiness comes from within. External circumstances (even Disneyland) cannot blot out a mournful, spiteful, bitter, or ungrateful heart. Take care of your soul everyday. You don’t have to go to Disneyland to be happy. Okay, on to the fun stuff. My husband and I made sure to eat a good breakfast before heading to the park. You don’t want to enter Disneyland on an empty stomach. Churros, ice cream, candy, cookies GALORE. I just happened to have prepared a hearty Paleo Trail Mix for just this reason. In the afternoon we needed some ACTUAL food. So i settled on a Chef Salad. I asked them if I could have one with out the cheese and the Chef informed me that she would have to make it from scratch with all new ingredients. And that it would take about 10-15 minutes. Um, so you mean that you are going to specifically prepare a brand new salad just for me, with no possibility of contamination or the threat of eating something that’s been lying around for a half hour? Yes, yes Please and Thank you. 10 – 15 mins!? Why do people think it’s unacceptable to wait over 3 minutes for food? Granted, the chef REALLY took her time, but I would take a fresh handmade CLEAN salad any day. 2. not make you sick. Speak up. Most places will accommodate any allergy and don’t be afraid to be “that customer”. Toss it all in a bag! Next Post The Clean Slate Day 30! I never thought of adding jerky to trail mix! Looks good! 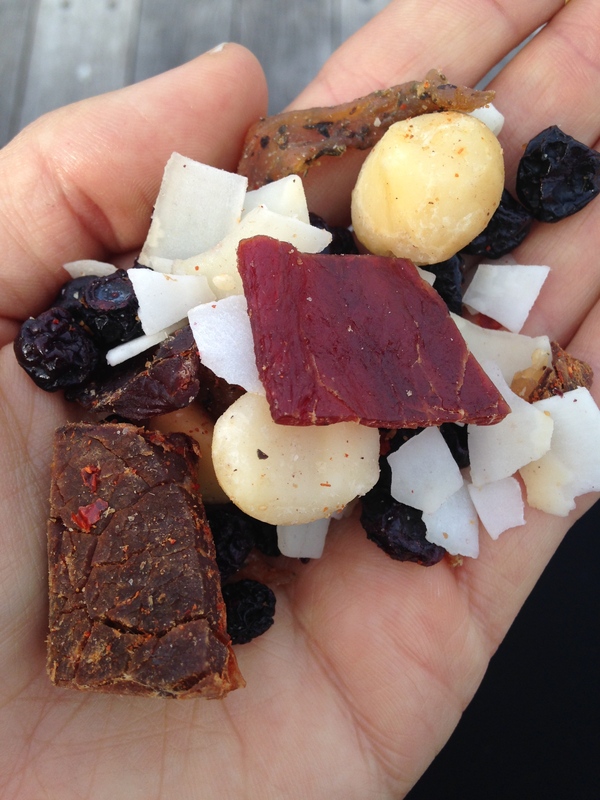 Ditto – I had not thought of adding jerky to trail mix but it’s a great idea to give it a protein boost. I’m flying (with children, no less) in the very near future and think I may try whipping up something similar (I’m notoriously naughty when I’m in the airport). I had no idea Dogfish Head made sausage! I love their beer, though. 😉 Where did you find it? I got the jerky idea from Sarah Fragoso over at everyday paleo 🙂 the sausages were new at whole foods and super tasty!